Building on the message of Don Tapscott’s highly successful book, The Digital Economy, Blueprint to the Digital Economy offers breakthrough insights and strategies designed to help today’s businesses succeed in an emerging and highly competitive digital business environment. Through first-hand accounts, top executives of world-class corporations like Kodak, IBM, Microsoft, and AT&T offer provocative examples of how their businesses used networking and multimedia technologies to achieve their individual corporate objectives. 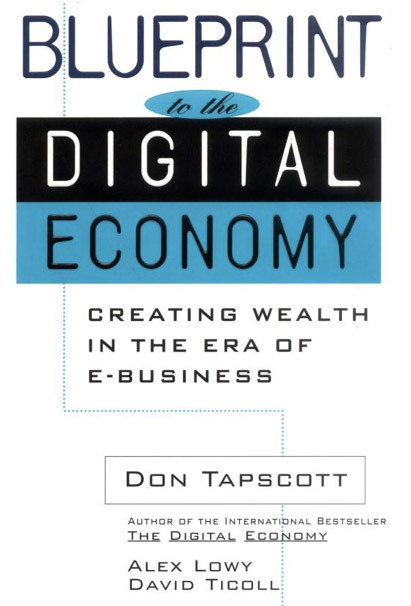 Tapscott’s Blueprint to the Digital Economy is a “must read” for all organizations jockeying for position within the fabric of the new economy. As we continue to face the challenges of the changing landscape of competition, industry and infrastructure, Blueprint provides the most insightful examination of today’s — and tomorrow’s market realities I’ve read yet. Tapscott’s editing team takes the reader along the path described in his earlier book, The Digital Economy. This collection of firsthand experiences from those most affected by digital convergence, is captivating reading. Blueprint provides concrete illustrations of how technology is creating a truly new economy.